FACT: 43% of Homeless Males Over 25 are Veterans! The Rand Corp. recently released a 499 page report titled “Invisible Wounds of War”. This report was briefly summarized by numerous news articles and Internet reports, including my previous article. I’m happy to say that the entire report is available for free download online, or you can purchase a hard copy for $50 from the Rand Corporation through their online bookstore (link below). A study published by the Rand Corporation shows that of the 300,000 troops affected by mental disorders of depression or PTSDless than half have been treated. Yes, that is 150,000 untreated heroes on active dury or recently released to the streets without proper treatment according to this independent study. The sad news continues… About one in five, about 20%, of our Iraq and Afghanistan active dury and veterans suffer from depression or PTSD. The Rand study says that too many soldiers and Marines are still slipping through the cracks since the symptoms of depression and PTSD can appear months after an incident, and many mental problems that appear later may never be caught, the study said. The RAND study interviewed 1,965 current and former service members and asked them how many had suffered from PTSD within the previous 30 days and suffered from depression within the previous two weeks. The study shows that 19.5% of veterans had received a concussion or other traumatic brain injury during their combat tour. The study found that some service members actively avoid a diagnosis of a mental health problem due to a fear of negative consequences of such a diagnosis. The worry is that co-workers would have less confidence in them after a diagnosis and thus impact their career. “When we asked folks what was limiting them from getting the help that they need, among the top barriers that were reported were really negative career repercussions,” Tanielian said. Please read the rest of this article (paraphrased above) here: Veterans Today. You can get a different take at Medical News Today. They report that 30% of our soldiers that are on their third or fourth tour have expressed emotional illnesses as gleaned from 2295 anonymous responses to the survey (11.9 % first tour soldiers, 18.5% second tour, 27.2% third tour). And from the Associated Press at the Atlanta Journal Constitution website. I encourage you to write the candidates at every government level and all of our current congressmen to encourage them to show their support by increasing the help for these wonderful men and women that have served our country. Let’s serve them now! Good News – Ask the right question! Al was frustrated. We were frustrated, even his case manager at MUST was frustrated. The new transitional housing program was due to start April 1 but to get in, Al needed to prove his eligibility and he needed his DD-14. The deadline was just a few days away. It was already March 26. He had his application in for months. He had his request for his DD-14 copy in for months. Nothing was happening. His case manager had even faxed in a copy of the application papers. No response. It looked pretty bleak as nothing was happening at the VA.
No DD-14 on the way and no good reason why. I don’t know the details other than this: Al said he had been conferencing with his case manager on Wednesday and they were both lamenting that nothing seemed to be working. Then Al happened to mention that he has a birthday coming up in a few months and he “needed to get his VA drivers license renewed”. Just a simple off-the-wall comment to pass the time. The case manager said something like: “WHAT did you just say?!! !… You have a VA drivers license?… Let me see it!” “This is all you need for proof… you are in!”. It turns out that no one had asked the right question. You don’t get a veterans driver’s license without a DD-14 and it requires a certificate of eligibility from the VA to get the licence. The existence of the driver’s license was all that has been needed all along. Now Al is going into transitional housing on April 1. It was an alert case manager that finally saved the day. It would have been easy to not notice the remark. None of us trying to help him knew. No one at the VA asked whether he had a veterans driver’s license. Al didn’t know it would suffice. Only the alert case manager caught the significance. Thank you Michael Laird of MUST ministries. Al once had his separation papers and has since lost them. That happens to homeless veterans a lot. He qualified for his veteran’s drivers license some time ago and has maintained it current. So much trouble and so much delay for lack of the right question. So if any of you veterans are having trouble getting a copy of your separation papers and you have a veterans drivers license, pull it out! You may have a shortcut! We have something special planned for Al, but don’t go hinting, as it is a surprise. Veterans receive a free license until they reach the age of 65. Then they must renew their licenses every five years and are required to pass a vision test each renewal period. Vietnam Veteran Mitch Robertson and his wife Vickie left their home in Montebello, Virginia for their vacation in Destin, Florida. On their way they stopped in Gaffney, South Carolina at a hotel for the night. When they woke up their vacation had turned bad. 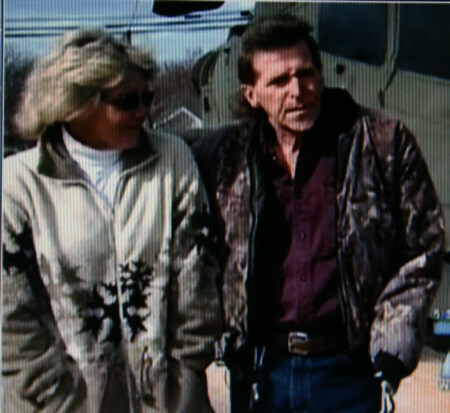 Mitch and Vickie went out to their car and found that someone had broken in and stolen their bags. In one of those bags was a Prosthetic Arm that helped give Mitch his freedom. Mitch had lost his entire left arm when his helicopter crashed in Vietnam. The prosthetic arm that was stolen is a bionic model that was made specifically for Mitch. Mitch not only has lost his arm but is also slowly dying from Agent Orange. The new bionic arm gave him hope that his remaining years would be easier and that it would give him the freedom to do things he hasn’t done in 38 years. Mitch put out a plea saying that who ever broke into his vehicle can keep his suitcase full of clothes and even the electronics that he had in there for his boat but please give him back his arm. Our own Lori Tucker, SouthEast Regional Manager for the VA Team contacted Mitch and Vickie today. Lori asked Vickie what can Soldiers’ Angels do to help. Vickie’s response: For right now please just help us get the word out. So to help this Veteran get his freedom back I’m posting this. Any one in the Gaffney, South Carolina area should be on the lookout and with ears wide open. It is not likely the thief will try to pawn it or to sell it, but it is likely they will keep it around for the novelty of it and word will get around, so if you hear something from your kids or neighbors about someone with an extra arm or showing one off, or if you find one discarded somewhere, or it is donated somewhere, please call the direct number to the manufacturer 1- (540)-292-1165 (number is on the charger) or contact me through my blog or contact the Florida Angels througth their website and also the local police and give them this story. If you have a blog of your own, consider posting this story there also! The Mayor of the City That Doesn’t Care (aka Marietta, Georgia) called me yesterday. Make no mistake our Mayor does care and cares deeply! We had a long and good discussion and he gave me full permission to report what he has said and he said all the right things. He is sympathetic to the problem and supportive of our mission to help the homeless, including those that are being evicted from the meager existence they call home, whether cardboard box, blue tarp, or simply a sleeping bag under a bush. He expressed appreciation for what we and and our mission team are doing and called it “good ministry”. The gist of it all, however, is that the unhoused homeless people have to be out by Wednesday (today) and there will be no exceptions and no delays due to the weather. He assured me that the city does not have any access to helicopters and no money to rent one if we did. That a helicopter was going to be used to hunt down the homeless was just a rumor that developed among the homeless after a meeting of a police commander with the nearby MUST ministries. MUST has been hosting some 75 residents and feeding the unhoused a meal each weekday. (The homeless were not invited to the meeting, but thought they were.) The city also met with the “Mad Housers” which is a group of saints that build simple structures for the homeless. The city is graciously allowing the Mad Housers to leave the structures in place until they have time to move them. Essentially the Mayor said that all homeless camping in Marietta will be sent packing and if they don’t go they will be immediately arrested. It was my understanding that all homeless camped on private property that have the permission of the property owner can stay, but the health department will be called to determine if there are suitable sanitary facilities, and whether the campsite is safely habitable. If not, they will be ordered out and arrested if they refuse the order. He suggested that some private property owners might allow them to camp, but the health department will be required to check out the property. The Mayor seems sympathetic but admitted he has had to call the police in the past about his own property (warehouse nearby) due to homeless camping behind it resulting in concern and complaints from female staff entering and leaving the building. How it started: The Mayor said that the problem started with a series of burglaries that were traced to a homeless person. They had his picture and went to all the camps to find him, but he had absconded, already left town for parts unknown. However the camps on right of ways and on public and private property which they found in the heat of the hunt are illegal and the City can’t NOT enforce the law, and now that the police know where they are, they must be removed, period, no matter the consequences. End of story. OK, herein lies a problem for my sensibilities. I’ve pulled out my copy of the 2006 Continium of Care (CoC) for Cobb County, Georgia’s grant application to HUD. It has a lot of tables and columns and at one point I put some of them in here, but then I remembered I have a lot of readers that could care less about that. Law Enforcement, listed in the category of “outreach”. Ok that explains it. Homeless arrests and Evictions are an “outreach”. Our local governments provide no preventive services and no supportive services for our homeless. Our non-profit local charities provide plenty of services but they are not enough! There are a total of 124 year-around emergency shelter beds among all our shelters. Plus another 48 “Seasonal” and another 18 “Overflow” beds. There were no beds “under development”. The application says that we are 330 emergency shelter beds short! This is based on finding 330 unsheltered homeless persons during the point in time count. That isn’t nearly all of them though! There are another 316 beds that are “transitional housing”. (6 under development) We are 275 transitional housing beds short! There are 44 perminent supportive housing beds. (none under development) We are 85 beds short. So Marietta: Where do you think our homeless friend Al is going to stay tomorrow night? How about the other 300 homeless people out there? The total of 690 needing help? The ones with “unmet needs” beds (virtual beds?) Where are they going? Who among our leaders care? There were 175 individuals in families with children unsheltered on January 26, 2006! And Marietta simply says “clean them out”. Take the veterans too. They might be carrying a flag. “Go South” you said. We already ship our poor sick to Grady. Are we to haul our homeless to Atlanta too? The full title of this report is “Scientific Progress Understanding Gulf War Illnesses: Report and Recommendations“. In the years since the war, thousands of Gulf War veterans have been evaluated and treated by government and private physicians. But the federal research effort has not succeeded in identifying treatments that substantially improve the health of ill veterans. Further, there are no programs in place to evaluate the effectiveness of treatments currently being used or to identify and develop treatments that may hold promise for these conditions. (…) Many of the veterans who served in the Gulf War were exposed to a variety of potentially toxic substances during their deployment. Among these were several neurotoxins-chemical nerve agents, pills taken to protect veterans from the deadly effects of nerve agents, and multiple types of pesticides-that belong to a single class of compounds that adversely affect the nervous system. Each of these findings are supported in detail with charts, data and supporting research documents that are organized by topic and by suspected causes. 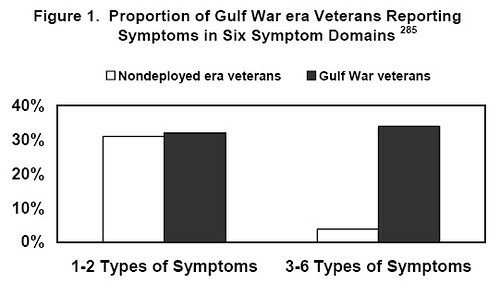 You can see from this figure that those in the Gulf war report 2 to 7 times as many symptoms as veterans not in the theatre. Many of the symptoms are common among veterans that did not serve in the Gulf War as shown in the left side of this figure. 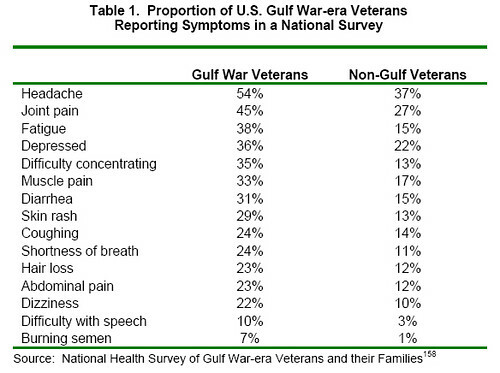 However, those veterans that were deployed in the Gulf are about 10 times as likely to report 3 to 6 types of symptoms from Table 1 than those not deployed. The excess illness column on the far right was used in the study to show that the excess illness was consistent among particular units of deployed veterans vs non-deployed veterans from the same area of the country. 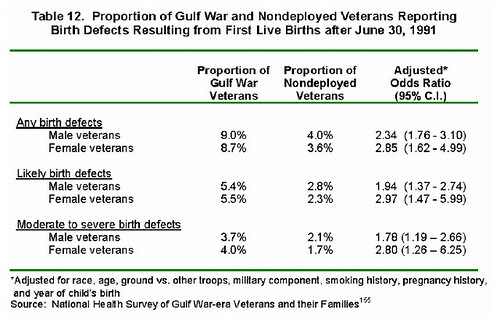 The ratio of deployed ill veterans was 2 to 4 times as high as those not deployed and even though they came from the same area as those that went to the Gulf . For example those from Kansas that were deployed in the Gulf had 2.5 to 4 times as many multiple symptoms than those from Kansas that were not deployed. This table is very alarming to me. It shows that the deployed Gulf War veterans are developing Lou Gehrig’s disease (ALS) at a rate nearly 4 times higher than those veterans not deployed as they age to 55 and older. ALS is a progressive neurodegenerative disease, with less than 10 percent of patients surviving more than five years after initial diagnosis. Possible effects of pesticides, PB (Pyridostigmine bromide pills used to pre-treat nerve gas exposure), and other AChEis (acetylcholinesterase inhibitors) chemicals used during the Gulf War. This topic was extensively discussed and seems to be of significant concern to those conducting the study. AChEis compounds are sometimes used for beneficial medications for Alzheimer’s Disease, but also to make pesticides and saran nerve gas. (…) these studies have consistently identified AChEis to be significantly associated with higher rates of symptoms and illnesses in Gulf War veterans. The uniformity of these results contrasts with a lack of consistent findings in multivariable analyses for such wartime experiences as participation in combat, exposure to oil fire smoke, and exposure to depleted uranium. Limitations in epidemiologic studies that rely on selfreported exposures always require a cautious interpretation of findings. Taken as a whole, however, this accumulated body of research provides compelling evidence of a probable link between neurotoxic exposures in the Gulf War and the development of Gulf War veterans’ illnesses. In 2001, a report from VA’s large National Survey of Gulf War-era Veterans and their Families indicated that Gulf War veterans reported a significantly greater number of post-war pregnancies that ended in miscarriages or children born with birth defects than nondeployed era veterans. This table is very alarming to me. It shows that the rate of birth defects for first live births for deployed veterans is two to 3 times as high as for those not deployed. This applies to children of both male and female veterans. Something is tragically wrong with this picture. The above is only a brief overview of this subject. Depleted Uranium is also a part of this study, but is largely discounted, but not thrown out. If you are interested in the details, the report is remarkably readable and available at the link above or can be viewed or downloaded here. This report is more than 3 years old. It will be interesting to see how many of its recommendations have been followed. 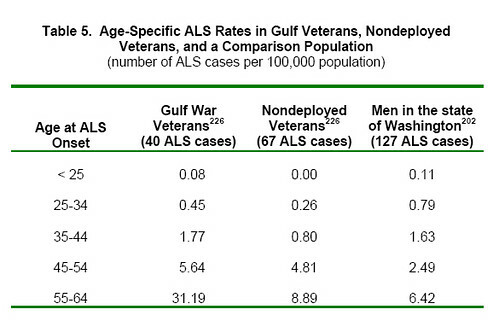 What is so heartbreaking is that the rate of ALS among deployed Gulf War Veterans is higher at all age levels than Gulf War veterans not deployed, 3.5 times as high at ages above 55, birth defect rates are double, Gulf War Veterans are 3 to 4 times as likely to be ill with these symptoms. Yet the funding is dismal, only about $31 million average a year through 2004. That is about $32.00 per deployed Gulf War veteran a year research funding. 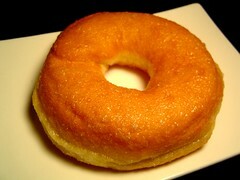 Hmm, 88 cents a day per veteran – about the cost of a single plain doughnut. The veterans deserve significantly more research, deserve the best possible treatment and deserve adequate compensation to offset their illnesses. They are all heroes to me.